Benchmark equity index BSE’s 30-share Sensex has corrected 9.86% from its all-time high of 38,989.65 on 29 August. Volatility in the Indian market has thrown a spanner in the works of companies looking to raise funds via the IPO route. The liquidity crisis facing NBFCs following the IL&FS defaults has added to the woes of companies planning to float public offers, given that they were already struggling with the volatility in secondary markets due to high crude prices and rupee depreciation. Why is there a lull in the IPO market? 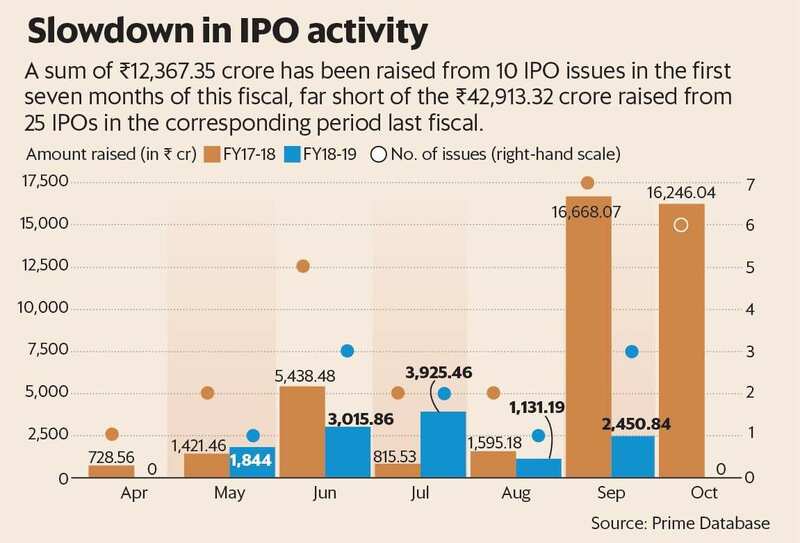 Volatility in the Indian market has thrown a spanner in the works of companies looking to raise funds via the initial public offerings (IPO) route. The recent correction in the markets has also deterred promoters and private equity firms who were looking at offloading their stakes and raising funds. Benchmark equity index BSE’s 30-share Sensex has corrected 9.86% from its all-time high of 38,989.65 on 29 August, and is currently trading at 35,144.49. Even as crude oil prices have corrected substantially, there has not been much respite for the markets. A strong dollar has also ensured weakness in the Indian currency. The lull in the IPO market started with the mayhem in the non-banking finance company (NBFC) space, triggered by defaults and downgrades at Infrastructure Leasing and Financial Services Ltd (IL&FS) in September. The market also panicked in the latter half of September after reports said DSP Mutual Fund sold about ₹ 300 crore of Dewan Housing Finance Ltd’s (DHFL) commercial papers at 11% in the secondary market. This sparked concerns over the home financier’s ability to raise funds at lower rates, and a possible contagion effect, despite the fund house clarifying that it had no credit issue with DHFL. Which companies have been hit the hardest? Mid- and small-cap companies have been most affected by the slowdown in the IPO market, given the sharp correction witnessed in valuations this year. Which listings were the first casualties? Housing finance company Aavas Financiers Ltd was the first casualty, with its shares closing 5.83% lower than the issue price of ₹ 821 on the listing day (8 October). The stock has shed 19% so far. State-run Garden Reach Shipbuilders and Engineers Ltd had also extended its IPO to 1 October from 26 September, but its shares slipped 10.93% on debut, and are down 23.73% since listing. The turmoil in the stock markets has made retail and high net-worth investors (HNI) wary of IPOs. What is the state of IPO markets? Companies continue to file draft red herring prospectuses (DRHP) with the markets regulator even as the IPO market remains dull. Over 80 companies have filed DRHPs this year, with around 19 of them filing in the last two months, when the secondary markets were particularly volatile. Firms are betting on the results of the upcoming state assembly polls (which will be announced on 11 December) and stable macroeconomic factors to launch IPOs early next year.